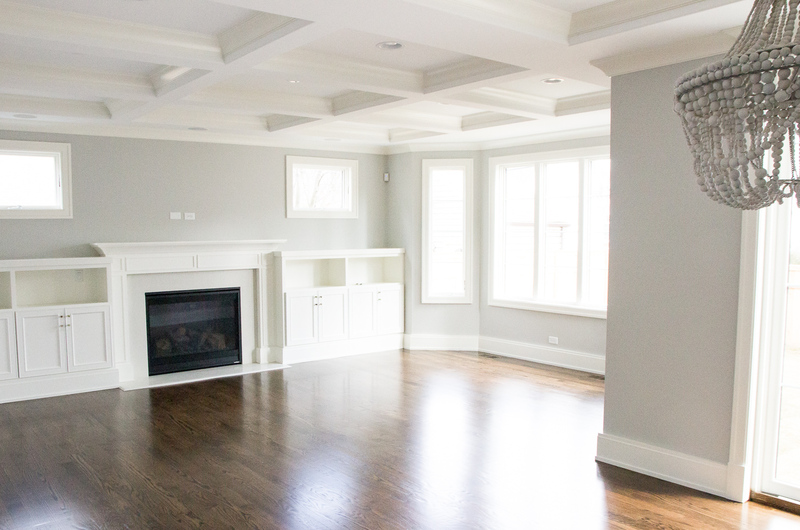 This new construction home in Elmhurst, IL was completed last Spring and was one of my all time favorite projects to work on. I’m finally getting around to sharing it today! Apparently it takes me a year to write about a project here after it’s finished haha! Remember a couple weeks ago I finally posted about how I organized our linen closet? That was done right after this home was finished 🙂 Thank you for all your awesome feedback on that btw! 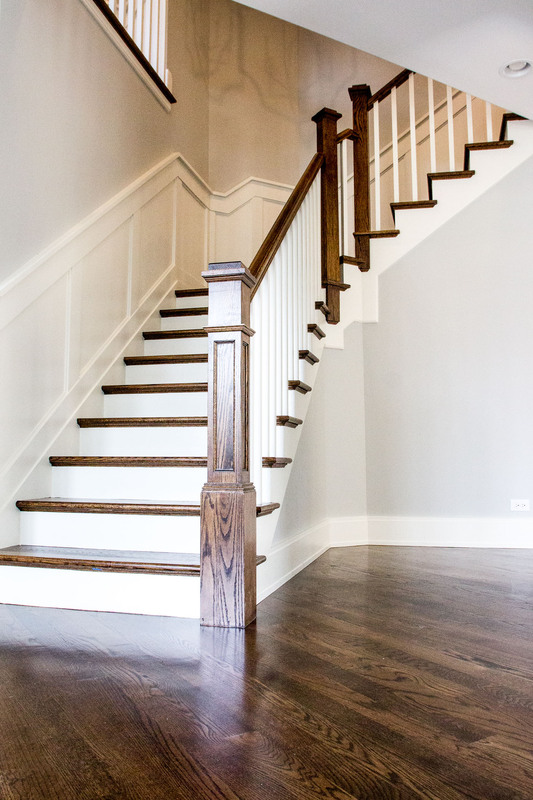 Here are a few photos taken of this new construction home right ON moving day. I was literally snapping pics as the moving trucks were unloading 😂. 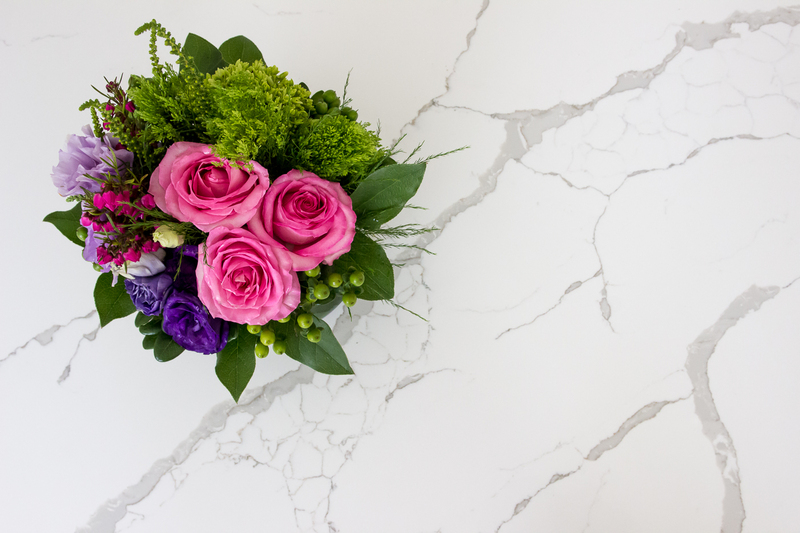 Also, now that the family has really settled in, I’ll be heading back to do a little “Spring Styling” session in their kitchen! 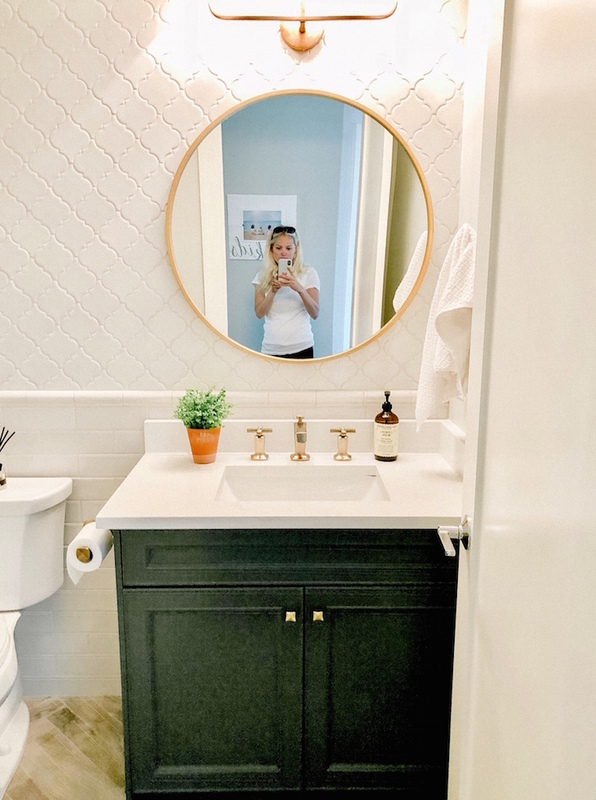 My client, who is also a very good friend allowed me to divulge how she scored the Serena & Lily counter stools that I sourced – but for FRACTION of the price. You’ll want to stay tuned for her secret shopping trick too! 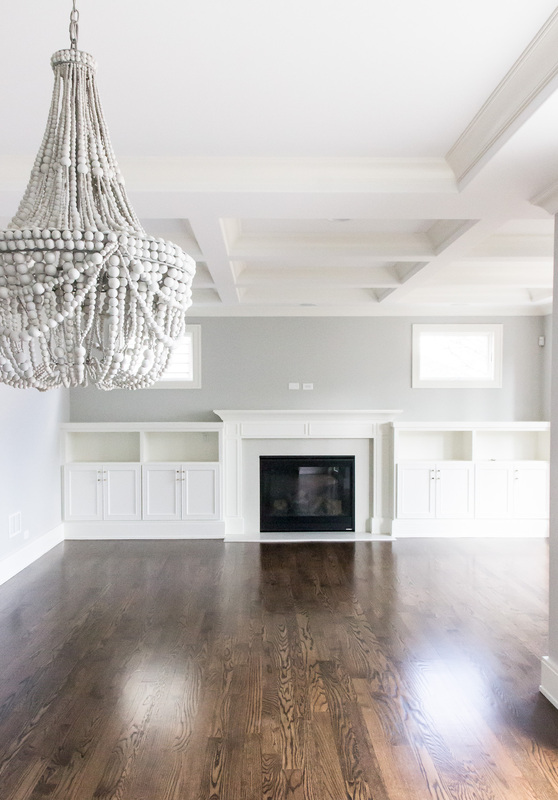 The builder for this home is Great Oaks Construction, based out of the western suburbs. 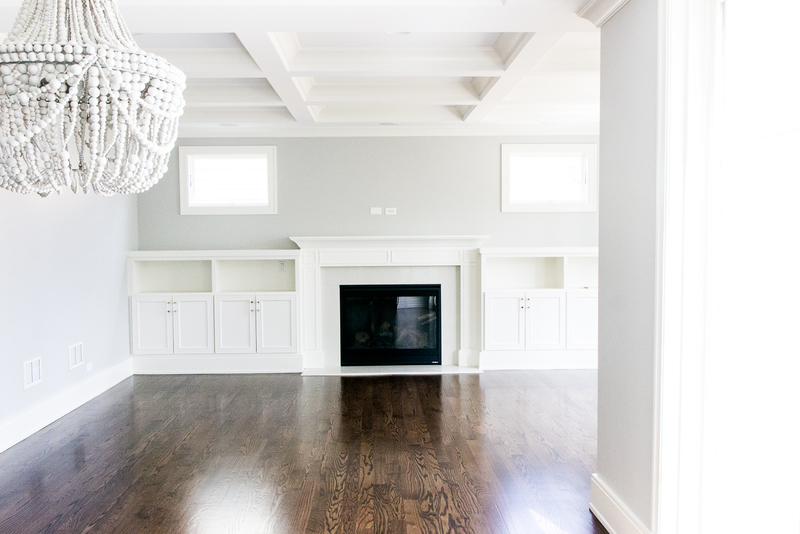 When my clients purchased the home, they had a tight deadline to finish everything before their target move in date. This was PERFECT for me because we got to make a lot of selections and stayed right on schedule! Did I mention Harper was due almost the same time as they were moving in? 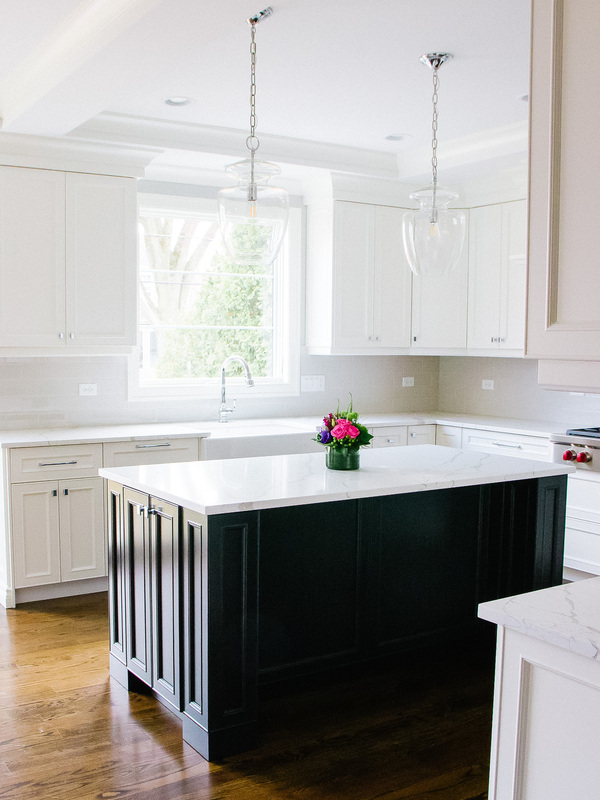 The countertops are a marble looking Quartz with heavy veining. 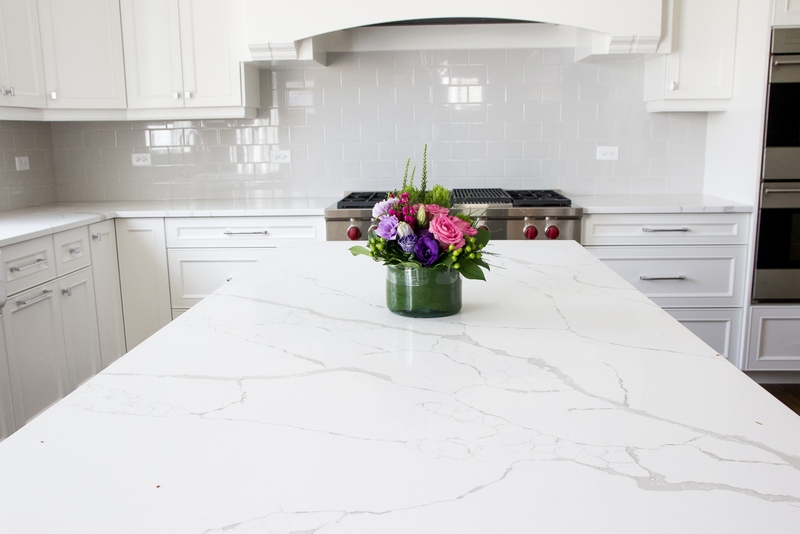 Quartz is a durable, beautiful and smart choice. Also, low maintenance! 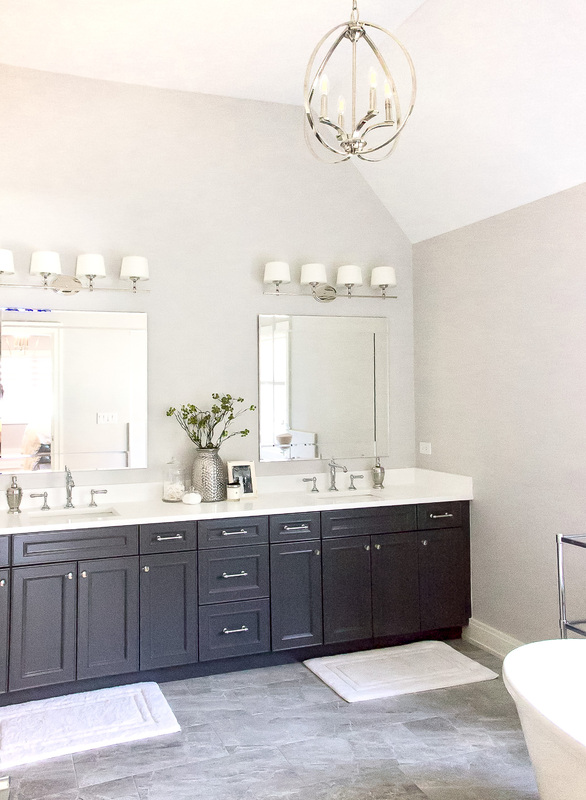 We used quartz countertops in all of the bathrooms and basement bar as well. 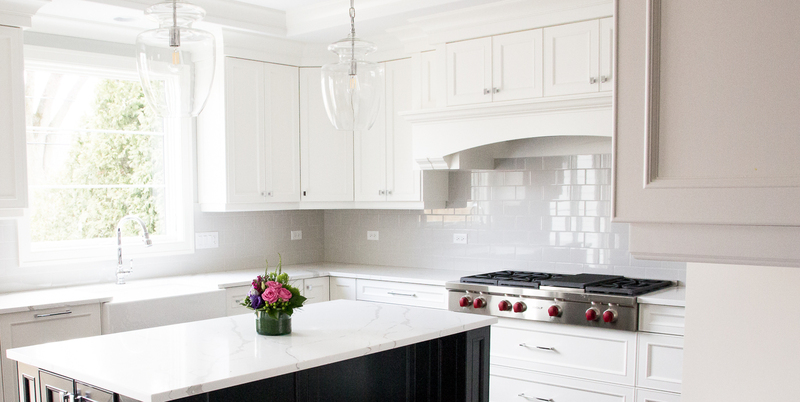 Since the paint colors for all the cabinets were already selected we went with a classic choice of solid white and another version of the marble looking quartz. 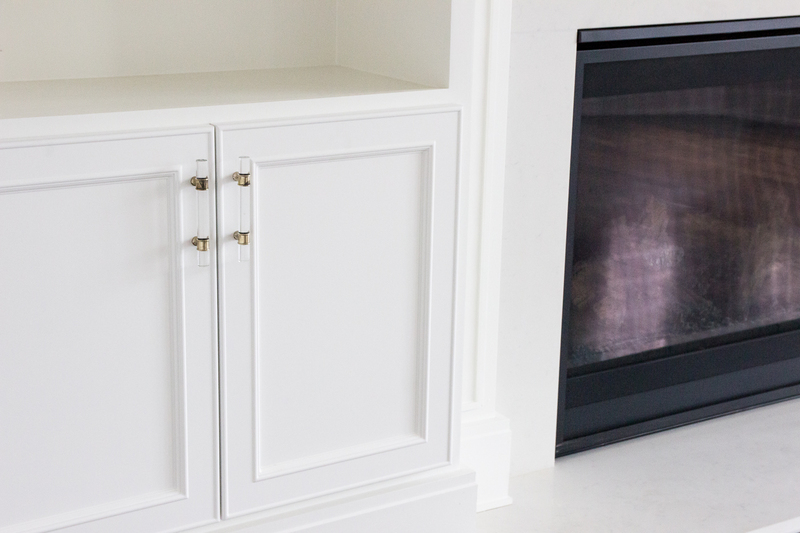 We used quartz as the fireplace surround which ties the living area and kitchen together nicely. 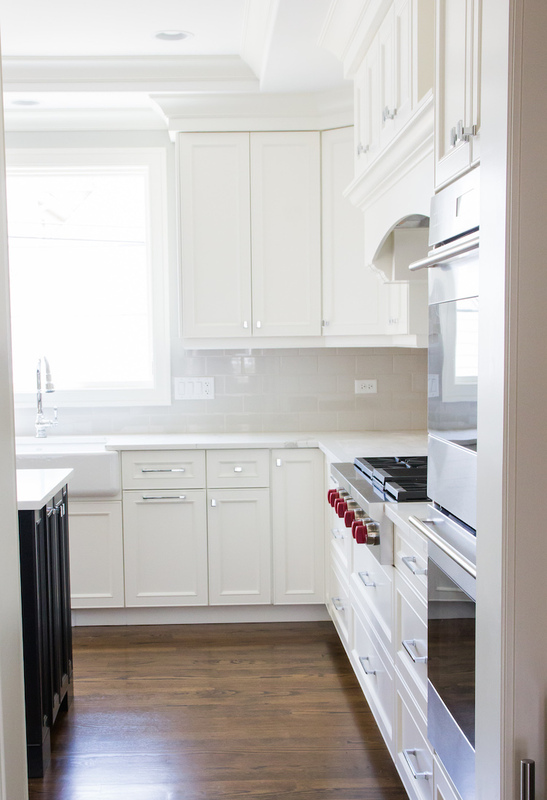 The built in cabinets were added to the original plan for the space. I love how they turned out! 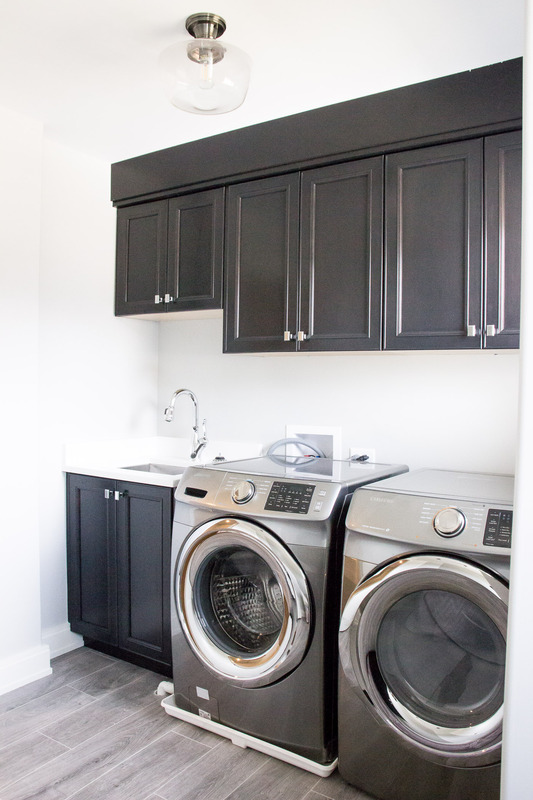 The mix of open and closed storage is perfect for a family with young kids. My client can display frames and books on the shelves while still corralling toys, etc. behind the doors. 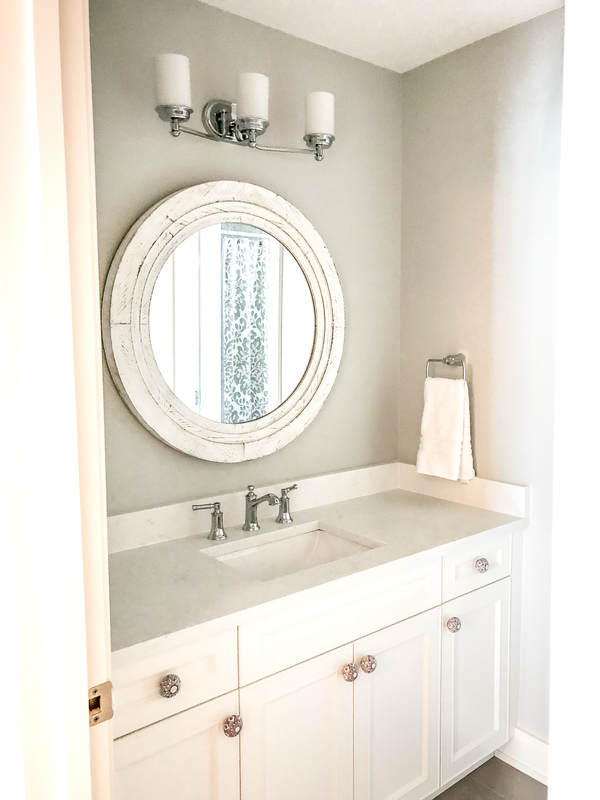 To keep a simple and classic look, a gray subway tile with white grout is always an excellent choice! 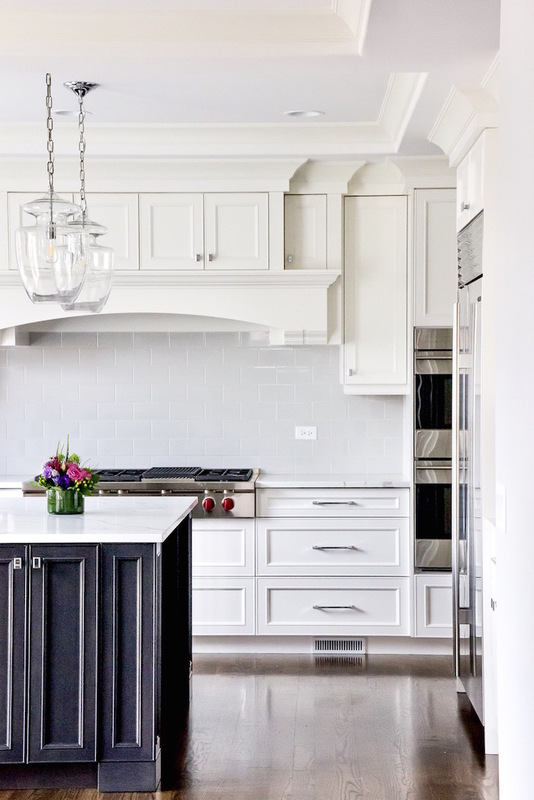 I’ve used this same tile twice now and it’s very versatile (Details in the Chicago Rehab Project post). Most of the tile in the bathrooms had already been selected but there were a few places that definitely needed to be switched out. 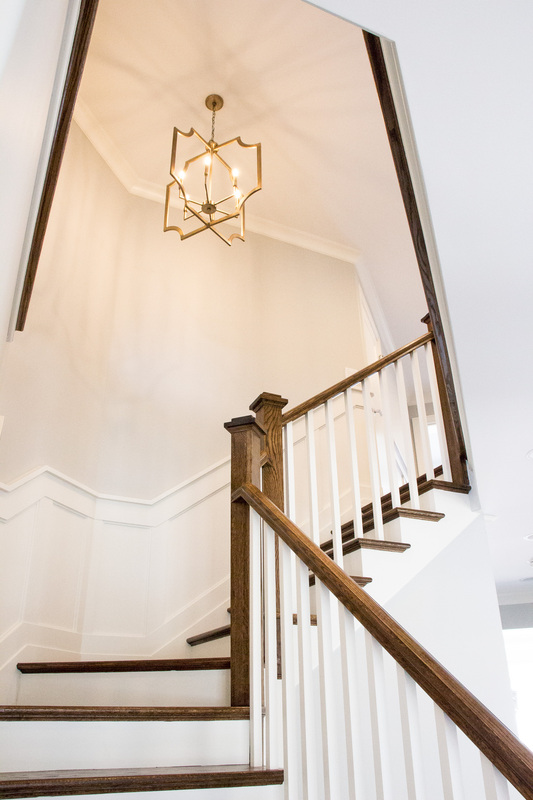 One note, in case you are considering purchasing a new construction home where things have already been selected…. don’t be afraid to ask the builder to rip something out! It may cost a little bit more, but its worth a try to ask early in the game. 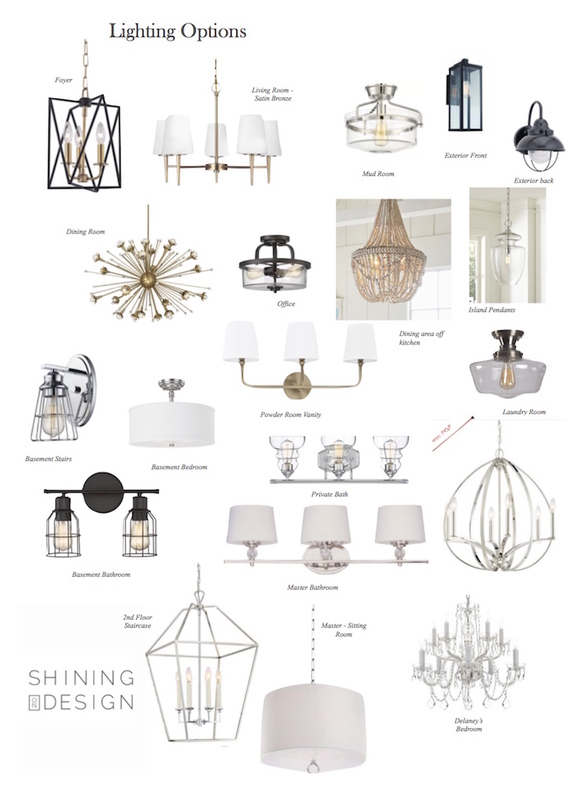 There were over 40 light fixtures sourced (including outdoor, closets, etc.) and we did this on a very tight deadline! 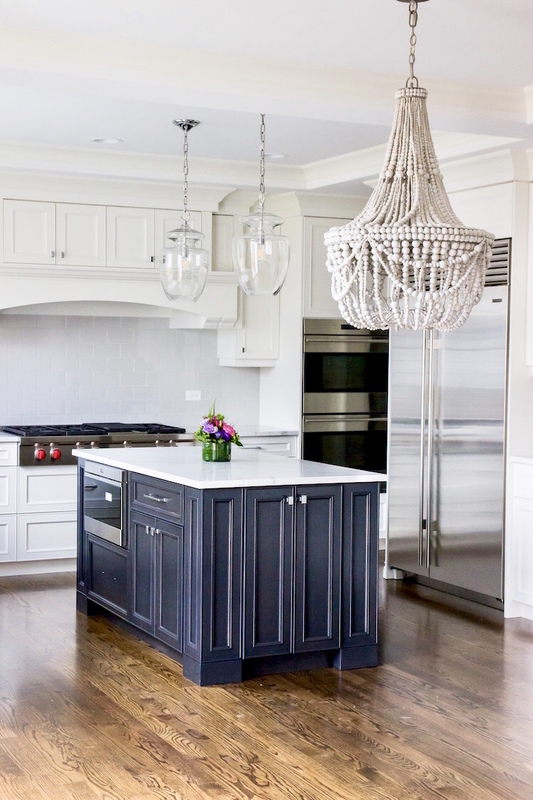 My favorite light fixtures are the beaded chandelier off the kitchen and the Jonathan Adler Sputnik fixture in the dining room (its a show stopper!). I’ll have to get a photo of that one. It was installed post move date (image shown below on board). 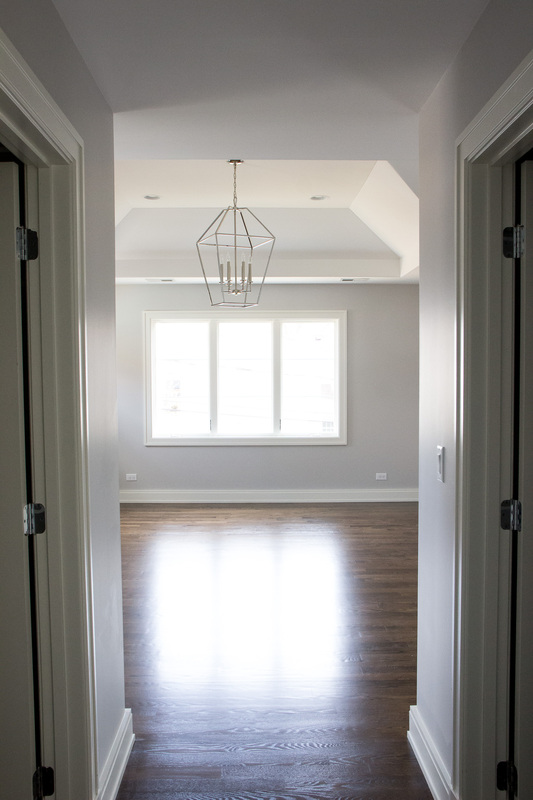 I won’t bore you with a ton of photos of empty rooms with only light fixtures but I do want to share some of the ones we selected! 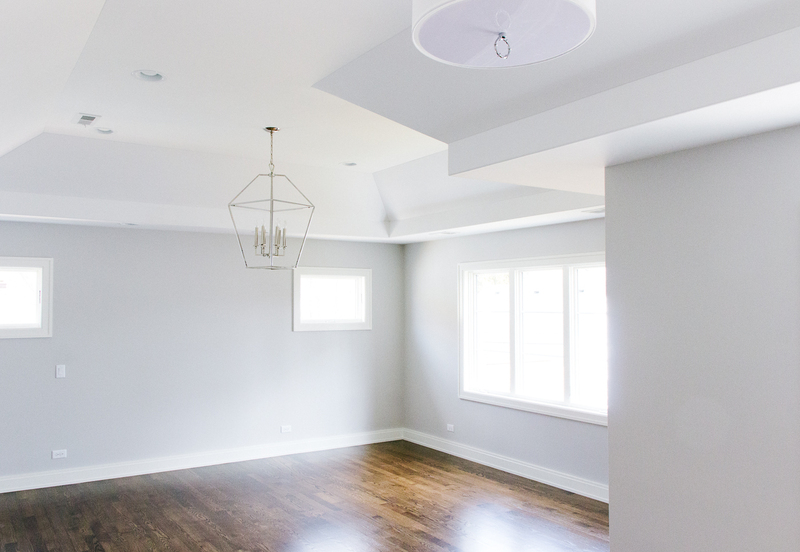 Selecting paint colors in a new construction can be overwhelming for some clients. You have to think about EVERY single room, bath, hallway, etc. AND they to need to flow nicely throughout the house. 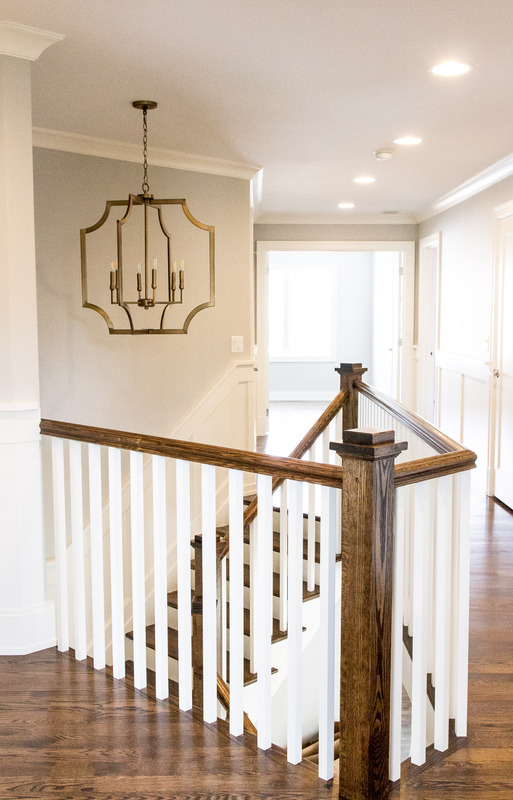 We used some of my go-to paint colors, including BM’s Stonington Gray throughout most of the main living areas and hallways. 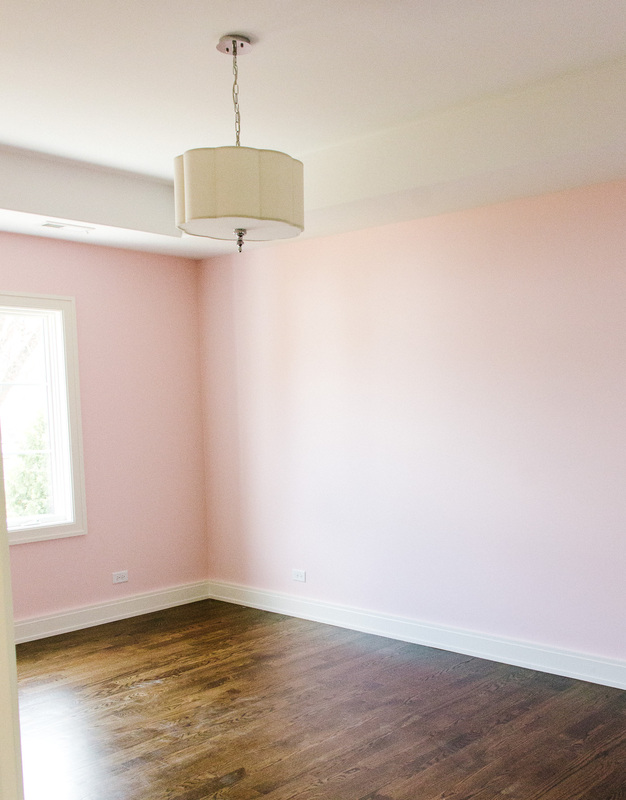 Although we used neutral colors throughout most of the house, this pretty pink was used in one of their little girls bedrooms. The “jewelry” of the home! We used a mix of higher end hardware (for high traffic areas) and budget friendly options as well. My friend found some really cute hardware at Hobby Lobby (you can see more of my go-to, affordable place to shop for hardware in this blog post!). Another thing we selected were window treatments for almost the entire house. These were installed after the move in date. 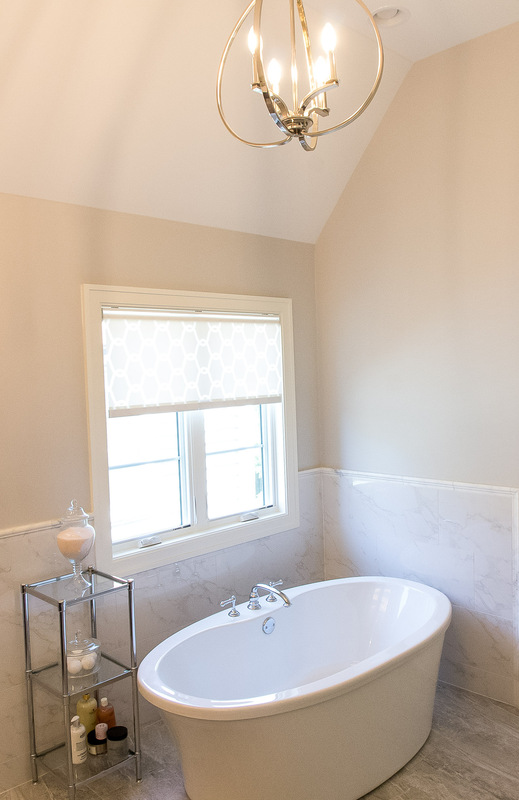 After discussing a few options for window treatments, we chose to go with The Shade Store for many areas. They always do a great job and although they weren’t installed yet while taking these pics, I’ll be sure to get some to share with you! The bathroom mirrors were also installed post move in. I snapped a few photos on my iPhone of a couple bathrooms to show you how these turned out! Master Bath. Hardware from Restoration Hardware. Mirrors custom made. Master bathroom. Yep, same master! The lighting looks different with chandelier turned on. One last look at the kitchen! I can’t wait to style this kitchen and share 🙂 I’m booked for my “Spring Styling” sessions but will be offering more in the summer. If you are in the Chicago area and are interested, let me know! This is my favorite post so far! We’re about to either buy or build a house (lived in nyc for 15 years) so this detail in the post is awesome! I’m quite interested in how you source the Serena and Lily stools, and other furniture that only trade professionals may know about. Thank you Kristin! That means a lot to hear this has been your favorite post! I can’t wait to share how she scored those stools –it’s a really GOOD tip!! 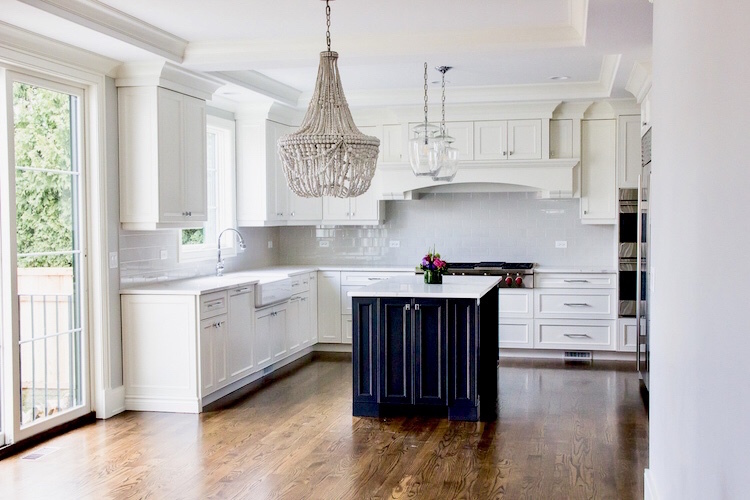 How exciting that you are going to buy a new home soon ~ please let me know if you have any requests for specific blog posts that you may find helpful!